I posted not so long ago about my blogging process and also my post schedule on Twitter in a chat and I received so many comments saying how organised it all was. I am obsessed with being organised so this didn't come as too much of a surprise for me, but it inspired me to write a post specifically on how to be more organised when it comes to blogging. 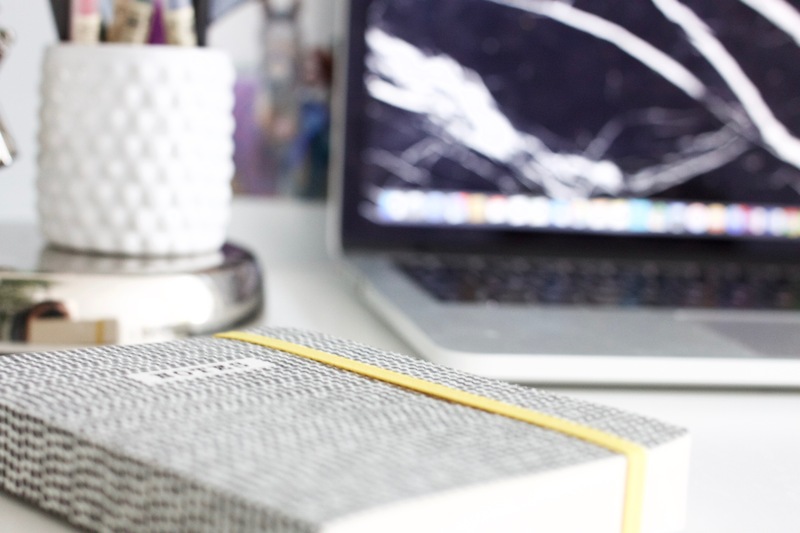 So here we are, tips on how to keep your blog organised. There's so much to do when it comes to blogging, that it can be hard to keep track of it all. Before I started blogging, I didn't realise how much effort goes in to running a blog. Well, running a blog if you actually want it to be read. There's the actual process of writing of the post, taking photos, SEO, formatting and so on, which takes up 20% of the time, and then promoting your blog and engaging on social media takes up maybe another 60-70%, and then the designing, website maintenance, replying to emails and all the other background blogging stuff that makes up the rest of the time. It's hard work, and there's so much to keep a track of that it's so easy to become disorganised with it. I'm not talking like a "post every Monday Wednesday Friday" schedule. I mean like a chart, where you can see what posts you're planning to do in the future, so you know what you need to get done. Folders don't use up memory, so make as many as possible. Name your things sensibly and you can search for the items too. I know a lot of people have post ideas all over the place, some never making it to paper (or screen). It doesn't matter where you keep your list of ideas, but make sure you keep it consistent. You could use a bullet journal or other notebook, an app on your phone, a spreadsheet, a napkin (not recommended) but anything really! Create a routine to do list you can always refer back to so you can ensure you haven't forgotten anything. This is important. I'm sure the reason why is fairly obvious. I thought as well as some sharing some tips, I'd share my personal organisation system so you may be able to pick up some inspiration and see the tips in practice, and also because it's changed a little bit since this post. It's took me ages to try and decide on a post schedule, but I think I've finally found a loose one which makes it so much easier when it comes to planning. Also with this schedule I know exactly what I need to do next for a post, or what I still need to get done. I also have a number of to do lists in this spreadsheet, a general running to do list, a design to do list, my daily/weekly/monthly checklists and a checklist to refer to before I hit publish. I told you I was organised! Another tab in my spreadsheet. Here I keep an overview of all my stats. I also have a more in detail one that I was keeping up to date with but have fallen a little behind with it. This contained all my views per post and then I had graphs set up so that it showed which time of day was most popular, which day of the week, which topic, and whether it being topical made a difference. However I wasn't getting tonnes of views at the time and I had a couple of posts that were skewing the data but it was interesting to see. I should probably start doing this again, but for now I just use Google Analytics as well as Twitter, Pinterest and sceptically Blogger analytics. Other tabs in this beast of a spreadsheet include my blog 'business' plan which keeps me focused and on track, copy codes where I have links to all my posts in both normal form and HTML code, social media links, code I use a lot in posts and the other odd thing I find myself copy and pasting a lot. I also have a tab which has links to all my fav bloggers, websites and other bookmarks and an inspiration tab. If my Dad is reading this (hi Dad!) then he'll probably be quite surprised I'm saying this, but I find myself backing up my laptop at least once a week if not more. I'm a little obsessed. I once accidentally deleted my photos folder on my old laptop (like 6, 7 years ago) which had 20,000 photos in, and then a pop up warned me that the folder was too big for the recycling bin so it would permanently delete, and I just clicked OK before I registered what the words even said. Then I noticed every single photo was gone. Heartbreaking moment. We managed to recover most of them though luckily. Even that didn't kick me into a habit of backing up my laptop. It was leaving it on the tram that made me get into the habit. Now I backup all my photos to Flickr, documents to One Drive everything to an external hard drive, and another copy of everything on a external hard drive in England (you know, just in case my flat burns to a crisp and my hard drive and laptop melt in the process or something equally as tragic). BACK UP YOUR STUFF GUYS. I hope this post is useful for anyone who is wanting to get organised with their blog. It's a little bit of effort to get a organisation routine going (making spreadsheets/charts/finding what works for you) but it really does pay off! I find I save so much more time now and I'm more focused because I know exactly what I need to get done. And it's super satisfying ticking things off! 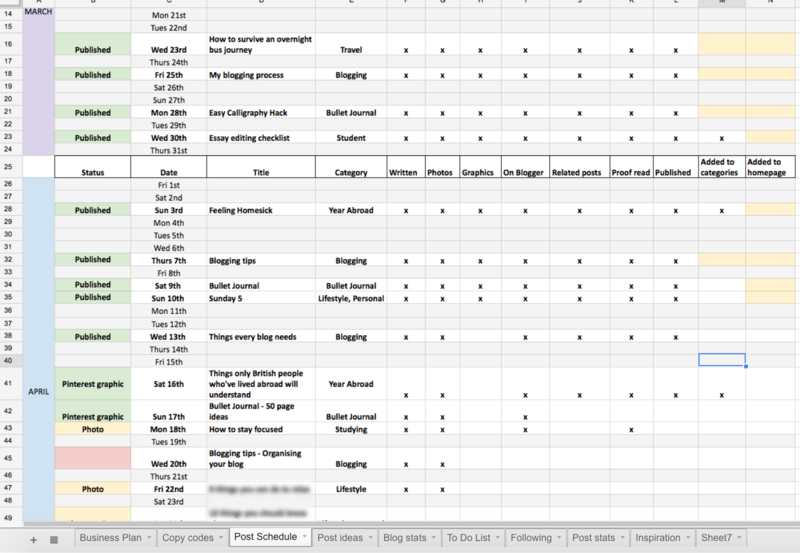 How do you organise all your blogging stuff?